In 1991, Matt Berninger and Scott Devendorf met while attending the University of Cincinnati's DAAP college of graphic design program, where they also met Mike Brewer, Casey Reas and Jeff Salem. Together, the five of them formed the lo-fi garage band Nancy, named after Berninger's mother, aspiring to sound like Pavement. The band was together for five years, and released one album, Ruther 3429, on Wife Records before breaking up after Berninger, Devendorf, Reas and Salem moved to Brooklyn. When the band was formed in 1999, it was called "The National", although the domain name of the band's website is americanmary.com because, according to Matt Berninger, "t's a song off our first record. We never thought of changing the (website) name, although we should have." Several of the members continued to work day jobs, including being involved in New York's dot-com boom, while performing free Sunday night shows regularly at Lower East Side venue Luna Lounge. Their first album The National was eventually released in 2001 on Brassland Records, a label founded by band members Aaron and Bryce Dessner, along with their friend Alec Hanley Bemis. When reviewing the album, Jason MacNeil of No Depression wrote, "...The National has created nearly a dozen picture-perfect Americana bar-soaked gems with its debut album. From the opening notes of 'Beautiful Head', the delicate line between polished roots-oriented pop and alt-country has rarely been walked so deliberately with the payoff so favorable." The National's second album Sad Songs for Dirty Lovers, released in 2003, was the band's first collaboration with record producers, Paul Heck and Peter Katis, who would later also produce the band's critically acclaimed albums, Alligator and Boxer. After the release of the album, renowned DJ Bernard Lenoir invited them to perform on his Black Sessions twice on France Inter. Publications such as Uncut and the Chicago Tribune named it an album of the year. In 2004, they released the Cherry Tree EP which included live favorite "About Today," as well as "All the Wine," the latter of which would appear on their next record. The release of the EP garnered further success and landed them on a successful tour with The Walkmen. In the same year, the band quit their day jobs and signed to a new label, Beggars Banquet Records, because the process of running their own label was becoming "too complicated". Their first album on Beggars Banquet, Alligator, was released in 2005. The album was met with much critical acclaim and featured highly in "Album of the Year" charts in the Los Angeles Times, Insound, Uncut, and many other publications. The album allowed the band increased exposure. NME and Pitchfork Media ranked Alligator as a top album of the 2000s. Alligator brought the band increased attendance at concerts, including sold-out shows at The Troubadour in Los Angeles and Webster Hall in New York. They also played at numerous festivals including the 2006 Pitchfork Music Festival, Reading and Leeds Festivals, Pukkelpop, and more. Their fourth album, Boxer, was released on May 22, 2007, and also received widespread critical praise. The album features contributions from various guest artists, including Sufjan Stevens and Doveman. It was voted as the No. 2 best album of the year by Stereogum.com and the No. 1 album of the year by Paste. The song "Slow Show" from Boxer was featured on the NBC series Chuck and Parenthood, as well as on The CW's One Tree Hill in its fifth season. The song "Start a War" was featured on the international science fiction series Defying Gravity, ABC's Brothers and Sisters, Fox's House, NBC's Parenthood, NBC's Friday Night Lights, Lionsgate film Warrior. The track "Fake Empire" was featured in the Season 2 Premiere of the HBO series Hung and on the third episode of season 2 of NBC's Chuck and in the pilot episode of Southland. An instrumental version of the song was featured in Barack Obama's campaign video "Signs of Hope and Change" during his 2008 United States presidential campaign, and the song was also played at the 2008 Democratic National Convention. On September 26, 2007, the band performed "Apartment Story" on The Late Late Show with Craig Ferguson. In the summer of 2008, along with Modest Mouse, they opened for R.E.M. on the promotional tour for the R.E.M. album Accelerate. That summer they played many festivals in North America and Europe, including Coachella, Roskilde, Sasquatch, Glastonbury, Haldern Pop, Rock Werchter, Optimus Alive!, Oxegen, Benicàssim, Lowlands, O2 Wireless, T in the Park, All Points West, and Lollapalooza. Boxer made numerous "album of the decade" lists, including Pitchfork Media, Aquarium Drunkard, Paste, and more. It has sold over 300,000 copies in the U.S. In May 2008, the band released their first feature-length documentary film titled A Skin, a Night on DVD. The film, directed by filmmaker Vincent Moon, documents the lives of the band surrounding the recording of Boxer and just before a show at the London venue Koko. Along with the release of the DVD was a CD collection of B-sides and rarities titled The Virginia EP. The National's collaboration with Vincent Moon began long before the filming of A Skin, a Night. Vincent Moon discovered the band after the release of their first album and became friends with its members after a show at Paris' La Guinguette Pirate. Soon after this meeting, Moon filmed his first music videos ever, which were for the National's songs "Daughters of the Soho Riots" and "Lit Up". Moon's photography also appears on the cover for Alligator. On February 17, 2009, a compilation album titled Dark Was the Night was produced by Aaron and Bryce Dessner and released by 4AD (the band's new label after Beggars Banquet Records merged into 4AD). The two-disc, 31-track compilation was released for the benefit of the Red Hot Organization, and featured a new song by the National and Nico Muhly titled "So Far Around the Bend". In the same year, the National collaborated with St. Vincent to contribute a cover of Crooked Fingers' "Sleep All Summer" to the Merge Records compilation Score! 20 Years of Merge Records: The Covers!. On May 6, 2009, the National performed "So Far Around the Bend" on Late Night with Jimmy Fallon. The National contributed a track to Ciao My Shining Star: The Songs of Mark Mulcahy in September 2009, an album in support of the former Polaris frontman, who lost his wife. They covered the Polaris track "Ashamed of the Story I Told", from their album Music from The Adventures of Pete & Pete. On March 10, 2010, the band performed "Terrible Love", the lead track from High Violet, on Late Night with Jimmy Fallon. On March 24, the band released "Bloodbuzz Ohio", the first single from the album, for free download at the official High Violet website. High Violet was released on May 11, 2010 in the U.S. to widespread critical acclaim. The album debuted with first week sales topping charts across the world, ranking No. 3 in the US, No. 2 in Canada, No. 5 in the United Kingdom, and No. 3 in Portugal, among others. The album has sold over 285,000 copies in the US and 600,000 copies worldwide. High Violet is a Gold Album in Canada, Ireland, Denmark, Belgium, Australia and the United Kingdom. On October 25, 2010, it was awarded a Q award, presented by Bernard Sumner of Joy Division and New Order, for Best Album. During 2011, the band capitalized on the success of High Violet and toured extensively in North America, Europe and Australia, including festivals in Ireland, Germany and Bohemia. On May 13, 2010, the band appeared on the Late Show with David Letterman, performing "Afraid of Everyone". On March 9, 2011 the National released a music video for Conversation 16 featuring John Slattery, Kristen Schaal and James Urbaniak. Two days later Valve Corporation announced the band would be contributing an original song, titled "Exile Vilify", for the video game Portal 2, and on April 12, 2011, the band released "Think You Can Wait" from the soundtrack of the film Win Win. On April 20, 2011, the National played Starlight Theater in Kansas City, Missouri. During the show, the band played "About Today", and dedicated the song in memory of Gerard Smith of TV on the Radio, who had died earlier that day of lung cancer. On December 8, 2011 the band performed on Q (the CBC radio show) in front of a live audience. Two new songs were performed for the first time: "Rylan" and "I Need My Girl". The third song performed was "Vanderlyle Crybaby Geeks" which featured Justin Vernon of Bon Iver who was also on the show. On March 24, 2012, members of the band, Scott Devendorf, Bryan Devendorf and Aaron Dessner, performed with Bob Weir in a live broadcast concert, The Bridge Session, at Weir's TRI Studios to bring awareness for non-profit organization, HeadCount. The National recorded The Rains of Castamere for the Game of Thrones season 2 episode "Blackwater". They also recorded a cover of the song "I'll See You in My Dreams" for the HBO TV series Boardwalk Empire, and a cover of the "Thanksgiving Song" from the Fox TV series Bob's Burgers. The track "Runaway" was used in the 2013 film Warm Bodies. Trouble Will Find Me was released via 4AD Records on May 21, 2013 in the US to widespread critical acclaim. The album debuted with first week sales topping charts across the world, ranking No. 3 in the US, Canada and the UK, among others. In its first week the album sold 74,722 copies in the US and has since sold 250,000 copies in the US alone. Following the release, the band embarked on a world tour in support of the album. Trouble Will Find Me earned a Best Alternative Album nomination in the 2014 Grammys. The album title was announced on February 25, 2013. The title, track list and album art were revealed on March 21. The band released the video for 'Demons', the first single from the album, on YouTube on April 8. During a Reddit AMA on May 8 they premiered the video for "Sea of Love", based on Zvuki Mu's video for Grubiy Zakat. On February 28, 2013, they announced the upcoming release of a documentary chronicling the lead singer's brother Tom Berninger's journey of touring with the band. The film, titled Mistaken for Strangers, premiered at New York City's Tribeca Film Festival on April 17. Mistaken for Strangers has been described as "a funny, eccentric and finally deeply poignant depiction of art, family, self-sabotage and the prickly intricacies of brotherly love." The film had a theatrical release in theaters across the United States and Europe. In 2013 they contributed the song "Lean" to the official soundtrack for the movie The Hunger Games: Catching Fire. "Fireproof" was used in 2 episodes of the USA network's "Covert Affairs" Season 4 - "Vamos" and "River Euphrates". "Hard to Find" was used in an episode of the USA network's "Suits" Season 3 - "Conflict of Interest." It was also used on "The Originals" Season 1, Episode 11 "Apres Moi, Le Deluge." "England" was used in an Apple iPhone 5S commercial during the 2014 World Cup. On April 2, 2015, the National released the single "Sunshine On My Back". The song is provided as a free download for renting or buying the band's documentary Mistaken for Strangers at its official website. The song comes from the Trouble Will Find Me recording sessions and features Sharon van Etten. On August 23, 2015, Consequence of Sound reported that, in addition to a slew of side-projects undertaken by both Berninger and the Dessner Brothers, the band is hard at work on their seventh album. According to the article, the band has 30 songs in the works. On October 16, 2015, the band debuted a new song called "Roman Candle" (later changed to "Checking Out") at Troubadour in Los Angeles. On March 2, 2016, it was announced that the band were to Headline Latitude Festival of The UK. In August 2016, Berninger indicated that the new album had electronic influences while they premiered the song "Prom Song 13th Century (Frankie & Johnny)" featuring St. Vincent. On May 11, 2017, the single, "The System Only Dreams In Total Darkness" was released after two days of mysterious teasers. At the same time, a new album was announced, titled Sleep Well Beast, which is expected to be released September 8, 2017. The band is scheduled to go on a worldwide tour in support of the album starting in the summer. In support of High Violet, the National spent summer 2011 playing a wide range of festivals including Heineken Open'er Festival, Reading and Leeds Festivals, Sziget Festival, Rock Werchter Festival, Skanderborg Festival, Electric Picnic and St. Gallen Open Air Festival. Summer 2011 also saw the National take a turn headlining their first major European festival, Latitude. In October 2011 the National discussed their career with Dr. Atul Gawande and performed an acoustic set with string quartet at the New Yorker Festival. Other participants in the festival included luminaries like Jhumpa Lahiri, Colson Whitehead, and the entire cast of Arrested Development among others. In December 2012 the National curated All Tomorrow's Parties festival in Camber Sands. The National played at a few major festivals in the summer of 2013, including The Boston Calling Music Festival in May, Bonnaroo in June, Bunbury Music Festival in Cincinnati and two of the biggest European festivals Roskilde Festival and Rock Werchter in July. They then returned to North America for Lollapalooza and Outside Lands Music and Arts Festival in August, St. Jerome's Laneway Festival in September, and Austin City Limits in October. The National returned to headline The Boston Calling Music Festival in September 2014, along with Lorde and The Replacements. In June 2014 the National played 3 consecutive shows at the Celebrate Brooklyn Music Festival. The band closed the summer of 2014 with performances at major festivals throughout Europe, including NorthSide, Pukkelpop, Way Out West, and Lowlands, and continued to headline festivals in the U.S. and Canada throughout the fall. The National headlined a handful of festivals in 2015, including Eaux Claires, a music festival held in Eau Claire, Wisconsin curated by Bon Iver frontman Justin Vernon and The National's Aaron Dessner. They also headlined Treasure Island Music Festival. In 2016 the band headlined such festivals as Bluesfest Byron Bay, Auckland City Limits, Field Trip, Down The Rabbit Hole, Super Bock Super Rock, Latitude Festival and Longitude Festival. In 2016 they also played Free Press Summer Festival, Tinderbox, Pistoia Blues Festival and the first annual Panorama Festival in New York City. In 2008 the band designed a T-shirt for the Yellow Bird Project to raise money for Safe Space NYC, an organization which provides safe refuge for underprivileged children and families in Southeast Queens. The band supported Barack Obama's presidential candidacy in 2008. In July of that year, the band designed and sold a T-shirt featuring Obama's image above the words "Mr. November," a reference to both their song from Alligator and the month of the U.S. presidential election. All proceeds were donated to Obama's campaign. On October 16, 2008, the National played a rally for Barack Obama on Fountain Square in their hometown of Cincinnati with The Breeders. Buses for early voting were available before the show to take voters to the Hamilton County Board of Elections. On September 28, 2010, the National played in front of over 25,000 people before a speech by President Obama at a rally in Madison, Wisconsin. The National have supported Partners in Health throughout the Trouble Will Find Me tour by working with Plus One to donate $1 from ticket sales at select shows to raise money for Partners in Health. On March 17, 2016 the band announced Day of the Dead, a charity tribute album to the Grateful Dead released by 4AD on May 20, 2016. Day of the Dead was created, curated and produced by Aaron and Bryce. The compilation is a wide-ranging tribute to the songwriting and experimentalism of the Dead which took four years to record, features over 60 artists from varied musical backgrounds, 59 tracks and is almost 6 hours long. All profits will help fight for AIDS/ HIV and related health issues around the world through the Red Hot Organization. Day of the Dead is the follow up to 2009’s Dark Was The Night (4AD), a 32-track, multi-artist compilation also produced by Aaron and Bryce for Red Hot. Day of the Dead features collaborations and recordings from a diverse group of artists including Wilco, Flaming Lips, Bruce Hornsby, Justin Vernon, the National, The War on Drugs, Kurt Vile, Lee Renaldo of Sonic Youth, Ira Kaplan of Yo La Tengo, Jenny Lewis, The Tallest Man on Earth, Unknown Mortal Orchestra, Perfume Genius, Jim James of My Morning Jacket, Senegalese collective Orchestra Baobob, composer Terry Riley and his son Gyan Riley, electronic artist Tim Hecker, So Percussion, jazz pianist Vijay Iyer and Bela Fleck. Of the 59 tracks on the compilation, many feature a house band made up of Aaron, Bryce, brothers Scott and Bryan Devendorf, Josh Kaufman (who co-produced the project), Conrad Doucette (of Takka Takka), Sam Cohen and Walter Martin. The National have a couple of tracks on the album, including "Peggy-O," "Morning Dew" and "I Know You Rider." A Day of the Dead live performance took place in August 2016 at the second annual Eaux Claires Festival (August 12–13) featuring Jenny Lewis, Matthew Houck, Lucius, Will Oldham, Sam Amidon, Richard Reed Parry, Justin Vernon, Bruce Hornsby, So Percussion, Ruban Nielson, and the National. On February 17, 2009, Dark Was the Night, the twentieth Red Hot Organization compilation, was released by 4AD. Curated by Aaron and Bryce Dessner, this album comprised songs by bands and artists such as Arcade Fire, Grizzly Bear, Beirut, David Byrne, Sufjan Stevens, Spoon, The Dirty Projectors, Feist and the National, among others. Over one million dollars of the proceeds from album sales were donated to the Red Hot Organization, an international organization dedicated to fighting AIDS. On May 3, 2009, Aaron and Bryce Dessner curated a concert for Dark Was the Night at Radio City Music Hall in New York City. Performers included David Byrne, The Dirty Projectors, Feist, the National, and several other artists who contributed to the compilation. Red Hot Organization founder and director, John Carlin, was quoted as saying, "Dark Was the Night encapsulated the spirit and creativity of a new generation of musicians whose work struck a chord and got people to actually purchase the album and raise hundreds of thousands of dollars to fight AIDS." 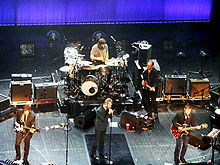 The National have played numerous benefits for a range of organizations, including MusiCares, Artists for Peace and Justice and the Robin Hood Foundation. They have also played at Philip Glass's Tibet House (an organization that is dedicated to preserving Tibetan culture) at New York's Carnegie Hall twice: once in 2009 and once in 2014. The annual show is organized to help raise money for "the cultural institution" of the Tibetan heritage. In October 2015 the National played two shows at The Troubador in Los Angeles benefitting Cooperative for Education and their Thousand Girls Initiative, which is a program aimed at supporting the growth of educational opportunities for girls in Guatemala. In November 2016, the National played a concert for presidential candidate Hillary Clinton. The National has been compared to Joy Division, Leonard Cohen, Interpol, Wilco, Depeche Mode and Nick Cave & the Bad Seeds. The band's lyrics have been described as "dark, melancholy and difficult to interpret." ^ Williamson, Alan (2013-05-26). "Interview: The National's Scott Devendorf". Retrieved 2013-06-11. ^ Harrington, Richard (2007-09-07). "The Washington Post: Getting Closer to the Truth With the National". Retrieved 2010-09-11. ^ Purcell, Andrew (2010-04-22). "The Guardian: The National: gloomy...with a hint of sunshine". London. Retrieved 2010-09-11. ^ "ruther 3429". Retrieved 2011-08-24. ^ "Royal Crow: The National - Interview". sixeyes.blogspot.ca. ^ "Official Brassland Records page". Retrieved 2010-07-13. ^ "Album Review - The National - Self-Titled". No Depression. 2001-10-31. Retrieved 2010-07-13. ^ a b "Brassland Official page on Sad Songs For Dirty Lovers". 2003-09-03. Retrieved 2010-07-13. ^ Tom (6 August 2005). "The National – Interview". Sixeyes.blogspot.com. Retrieved 2009-02-20. ^ "The National: Alligator (2005): Reviews". Metacritic.com. Retrieved 2009-02-20. ^ "The Top 200 Albums of the 2000s: 50-21". Pitchfork Media. 2009-10-01. Retrieved 2009-10-01. ^  Archived January 3, 2010, at the Wayback Machine. ^ Boxer by The National. metacritic.com. Retrieved on July 30, 2009. ^ Hogan, Marc (2008-10-29). "You Can Vote However You Like". Pitchfork Media. Retrieved 2010-01-23. ^ "The National Team Up With Obama To Bring "Signs Of Hope & Change"". Stereogum. 2008-09-03. Retrieved 2010-01-23. ^ "Aquarium Drunkard » Decade :: The National, Boxer (2007)". aquariumdrunkard.com. ^ "The 50 Best Albums of the Decade (2000-2009)". pastemagazine.com. ^ "Lit Up By The National". YouTube. 2006-02-13. Retrieved 2012-04-03. ^ "The National". High Violet. Retrieved 2012-04-03. ^ "High Violet". Metacritic. Retrieved 8 May 2010. ^ "The Awards 2010: Best Album - The National - News - QTheMusic.com". News.qthemusic.com. Retrieved 2012-04-03. ^ 2/1/11 (2011-02-01). "Kanye West, Black Keys, Wiz Khalifa Lead 2011 Woodie Award Nominees - Music, Celebrity, Artist News". MTV. Retrieved 2012-04-03. ^  Archived March 11, 2011, at the Wayback Machine. ^ "Indie rock band The National lend song to Portal 2". Destructoid. Retrieved 2012-04-03. ^ "TV On The Radio's Gerard Smith Dead At 36 - Music, Celebrity, Artist News". MTV. 2011-04-20. Retrieved 2012-04-03. ^ "Live from the Glenn Gould Studio with Brooklyn-based indie stars The National". CBC News. ^ Greenhaus, Mike. "The National and Bob Weir: Building A Bridge". Jambands.com. Retrieved 5 April 2012. ^ "Thanksgiving song on YouTube". ^ "The National Announce New LP Trouble Will Find Me | News". Pitchfork. 2013-03-21. Retrieved 2013-04-16. ^ "The National, 'Trouble Will Find Me': New Album Details Revealed". Spinner. 2013-03-21. Retrieved 2013-04-16. ^ "Watch the National's "Sea of Love" Video". ^ Snapes, Laura (28 February 2013). "The National Subject of New Documentary Film Directed by Frontman Matt Berninger's Brother Tom". Pitchfork Media. Retrieved 28 February 2013. ^ Hornaday, Ann. "'Mistaken for Strangers' Movie Review". ^ "Watch The National Perform "Graceless" and "I Need My Girl" on "Saturday Night Live"". ^ Andrew Trendell. "The National: 'Next album taking different approach'". gigwise.com. ^ "The National unveil surprise new single "Sunshine On My Back" — listen". ^ Powers, Ann (2 April 2015). "The National, 'Sunshine On My Back' - The 'Trouble Will Find Me' Session Recording Features Sharon Van Etten". NPR. Retrieved 24 May 2015. ^ Scott Lapatine. "Watch The National Debut New Song "Roman Candle" At LA Benefit Show". stereogum.com. ^ Philip Cosores. "Matt Berninger Takes a Break From "Everything Surrounding The National" with EL VY". villagevoice.com. ^ NME.COM. "The National go electronic on new album - NME.COM". ^ "The National Interview - The Talks". the-talks.com. ^ "Watch Bob Weir Join the National at Outside Lands". ^ "St Jerome's Laneway Festival - Sydney". lanewayfestival.com.au. ^ Reed, Fischer (20 March 2013). "Lollapalooza 2013 lineup: Mumford & Sons, Phoenix, Vampire Weekend & more". City Pages. Retrieved 2013-03-25. ^ Bedian, Knar (23 April 2014). "Boston Calling Announces September 2014 Lineup". Sound of Boston. Retrieved 2014-04-23. ^ Perry, Kevin E.G. (2012-09-29). "The Rider: What we're reading, wearing and watching this week". NME. Retrieved 2013-09-19. ^ "Yellow Bird Project News » Matt Berninger Talks YBP". yellowbirdproject.com. ^  Archived July 16, 2008, at the Wayback Machine. ^ Breen, Mike. "The National Talks Barack, Fountain Square Concert/Rally :: Local:Cincinnati :: Articles :: City Beat". citybeat.com. Retrieved 2010-09-29. ^ Van, Hart (2010-09-28). "Barack Obama brings Ben Harper and the National to Madison [UPDATE] - Minneapolis News - The Blotter". Blogs.citypages.com. Retrieved 2012-04-03. ^ Snapes, Laura. "The National Open for President Barack Obama in Des Moines, Iowa". Pitchfork. Retrieved 6 September 2012. ^ a b Skinner, James (2009-02-16). "Various - Dark Was the Night / Releases / Releases // Drowned In Sound". Drownedinsound.com. Retrieved 2012-04-04. ^ a b Oinonen, Janne. "Various Artists - 'Dark Was The Night' (4AD) Released". Gigwise. Retrieved 5 April 2012. ^ a b Watson, Gillian. "Various Artists - Dark Was The Night". The Skinny. Retrieved 5 April 2012. ^ Skinner, Jesse. "Good was the Compilation". Toro Magazine. Retrieved 5 April 2012. ^ Martin, Andrew. "'Dark Was The Night' Raises $1 Million for Charity". Prefix Mag. Retrieved 5 April 2012. ^ Breihan, Tom. "Dark Was the Night Raises a Million for Charity". Pitchfork. Retrieved 5 April 2012. ^ "'Dark Was the Night' at Radio City Music Hall: Bon Iver steals the show". 2009-05-04. Retrieved 2010-09-29. ^ "NPR: 'Dark Was The Night' From Radio City Music Hall". 2009-05-28. Retrieved 2010-09-29. ^ "Tibet House Benefit (Vampire Weekend, the National, Patti Smith) [New York, NY; 02/03/09]". Pitchfork. 4 February 2009. Retrieved 5 April 2012. ^ Thompson, Paul. "National, Vampire Weekend Set for Tibet House Benefit". Pitchfork. Retrieved 5 April 2012. ^ "The National: A Benefit for Cooperative for Education - Tickets - Troubadour - Los Angeles, CA - October 16th, 2015". ^ DiGravina, Tim. "Sad Songs For Dirty Lovers". Allmusic. Retrieved 4 April 2012. ^ Cheng, Cheryl. "Interview: Matt Berninger of The National". The Scenestar. Retrieved 4 April 2012.